1. Place the noodles in a heatproof bowl and cover with boiling water. Set aside according to packet instructions for 15 minutes or so until softened, but take care they don’t stick together. Drain. 2. Meanwhile, heat half the oil in a wok then crack in the eggs and cook for 1–2 minutes, scrambling until set. Transfer to a plate and set aside. 3. Add the remaining oil to the wok and cook the chicken for 5 minutes then add the prawns and pepper strips. Cook over a high heat for a further 1 minute. 4. Stir in the Flavour Pot, beansprouts, salad onions and noodles. 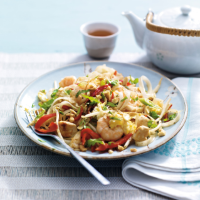 Cook for 3–4 minutes until the chicken and prawns are completely cooked through and the noodles are piping hot. 5. Stir through the cooked egg then divide between 4 serving bowls. Scatter over the nuts and coriander and serve. Save time on soaking the noodles by using a 300g pack of ready-to-eat, fresh Waitrose Rice Noodles.